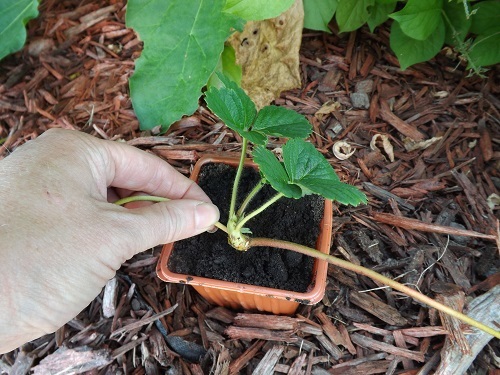 When I saw this recipe for a jam combining raspberry with jalapeno peppers, I was intrigued. Thinking back to the Jalapeno Jelly I made last year I wondered if this would be something we would actually eat. Although the jalapeno jelly was good, the uses were limited to a few appetizer recipes or possibly on a bagel with cream cheese. Being an extreme canner, I had to try it, even if it was only this once. Mince the jalapeno pepper and depending on how spicy you want the jam, remove or add the seeds. The seeds will make it spicier. 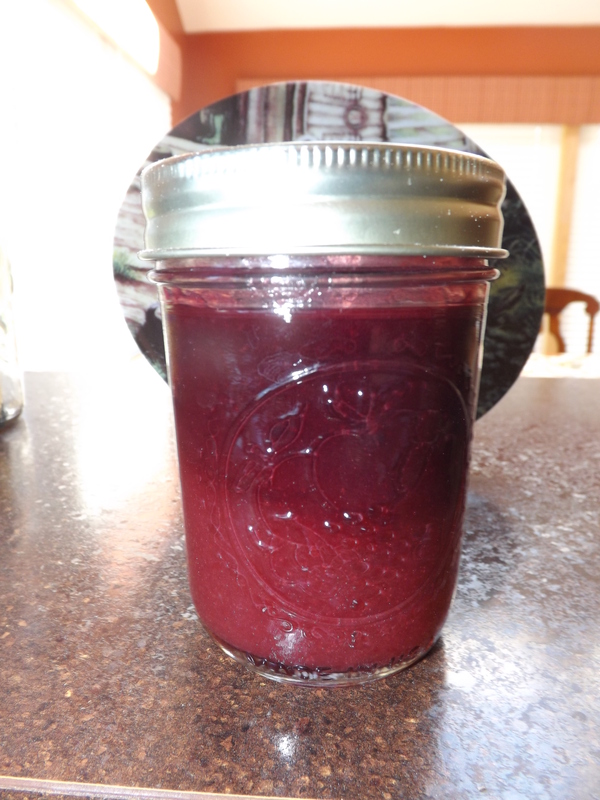 Combine the raspberry juice jalapeno pepper, sugar and lemon juice in stock pot. Bring to near boil. Add Clear Jel slurry and bring to boil for one minute or until thickened. Remove from heat and ladle into hot jars. Wipe rims, adjust lids, and process in water bath for 10 minutes. I began tasting this while the spread was cooking and at first the jalapeno taste was not noticeable. I saved a small portion in a bowl while processing the remaining and as it cooled the flavor of the jalapeno began to come through. 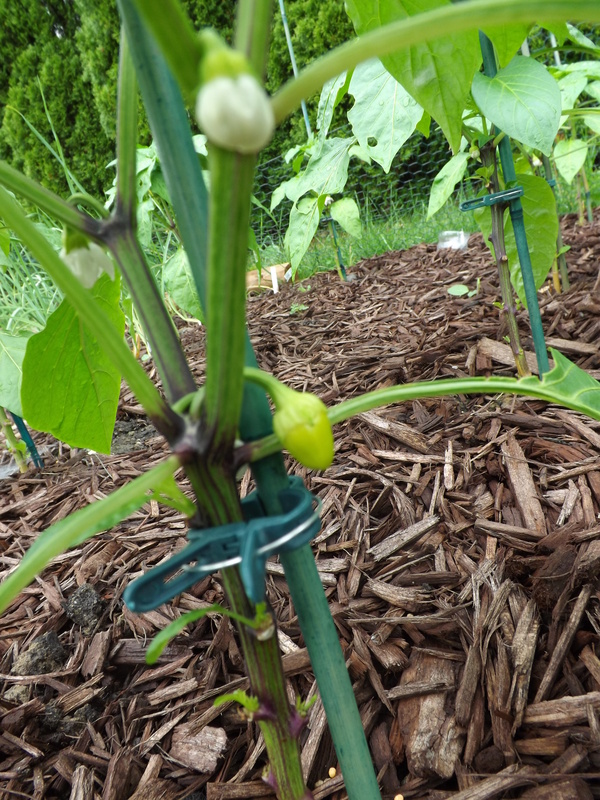 Using one jalapeno with no seeds gave it a slight pepper flavor with very little spice. If I were to make this again I would add a few seeds to the spread. I’ve been eating this spread on toast and find it a unique change from my other spreads. I’m glad I tried this and now have something a little different to share with family and friends, and for this I am — Simply Grateful. 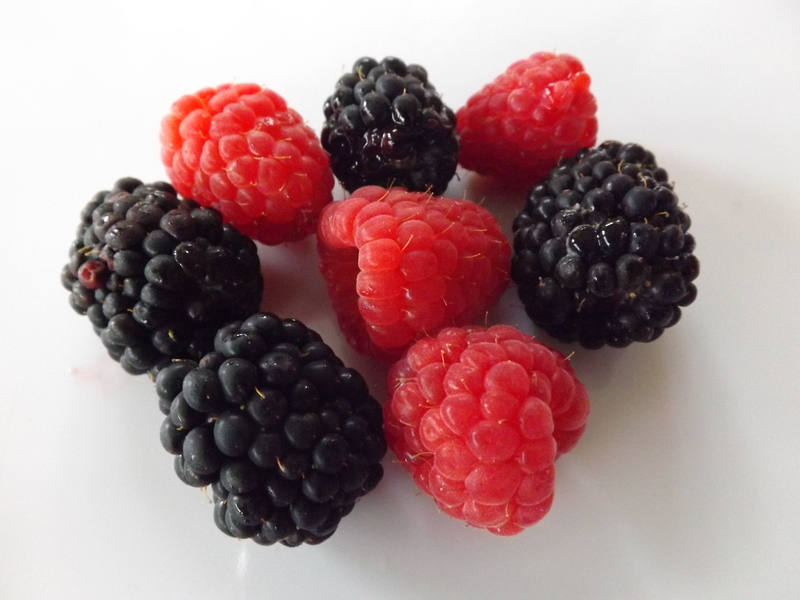 Combine raspberry juice, blueberries, sugar and lemon juice in large stock pot. Bring mixture to a near boil. Add Clear Jel slurry and bring to boil. Boil for one minute or until thickened. Remove from heat and let sit five minutes. Ladle preserves into hot jars, wipe rims, adjust lids, and process in water bath for 15 minutes. This preserve is excellent on toast, English muffins, bagels, or just about anything, and for this I am — Simply Grateful. It’s a muggy, hot and humid 92 degrees here in Michigan this afternoon, so of course I decided to cook something appropriate for the weather. NOT! I decided on sauerkraut with pork, sausage, and dumplings. This calls for the stove to be running for at least four hours at the highest setting. Granted that’s only one burner, but then the other four are going intermittently to make the dumplings, sear the pork, and what would this meal be without some garlic and white beans on the side. Oh, and did I mention, our air conditioner is on the fritz? Well, it just wasn’t hot enough in my kitchen this morning after canning another batch of pickles, so heck, why not throw on a pot of sauerkraut to heat things up to that oh so pleasant temperature of 97 degrees? Now this wouldn’t have been such a bad idea, if when I went to test the meal, about two hours before serving, I didn’t notice that my homemade sauerkraut was too sour and too salty. With homemade sauerkraut, I find rinsing it prior to cooking is not a good idea. The reason being that many times all the sour gets washed out. When this happens, there is no fix other than opening another jar and adding it to the washed sauerkraut. Therefore, I empty the jars of sauerkraut into a stock pot and add several jars of water to start the process. As the kraut cooks I add water to it as necessary so it doesn’t cook down and burn. Usually this is enough to tone down the sourness and make the sauerkraut perfect by the time dinner is served. Today I used two quarts of sauerkraut and added about three quarts of water. After adding the sausage, pork, and dumplings, my 8 quart pan was pretty full. This was left to boil for several hours. When I tasted it however, the sauerkraut was too sour and salty to the extent of almost being inedible. My fear was that if I were to wash the sauerkraut now, I would be left with tasteless sauerkraut and the meal would be ruined. Doing nothing however would result in the same, so here is what I did. First I removed as much of the meat as I could. Then I strained out most of the original water in the stock pot, reserving it for later. Next I filled the pot half full with fresh water and returned it to the stove. Right away I tasted the sauerkraut and found the salty taste gone, unfortunately so was the sourness — just what I had feared. But, I had planned on this. So, slowly I added back some of the reserved original water. Each time I added the sour liquid I let the pot come back to a boil and then did a taste test. Eventually I got it to my liking and then added back in the meat. 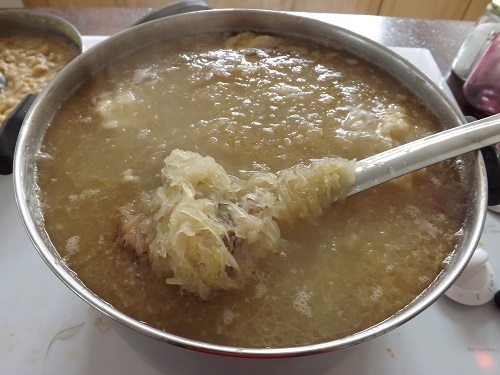 Once the meat was back in the pot and it came to a boil I again tasted the sauerkraut. Because of the reintroduction of the meat the sauerkraut was a bit more sour and a little more salty. Not too much, but definitely something that should be kept in mind next time. It is possible that the meat could have taken the salt/sour ratio over the top again, so in the future I will add the meat back to the pot immediately and start taste testing from that point. In hindsight, making this meal on the hottest day of the year might not have been the smartest thing, but I learned something new and that made it well worth it, and for this I am — Simply Grateful. 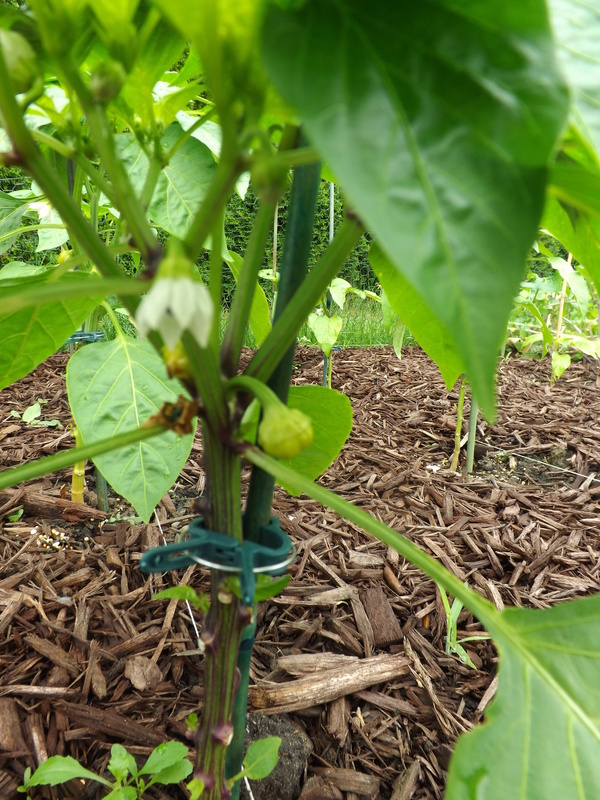 The one crop in my garden that I have been the most nervous about this year has been the Romainian, Szegedi, and White Cloud peppers. 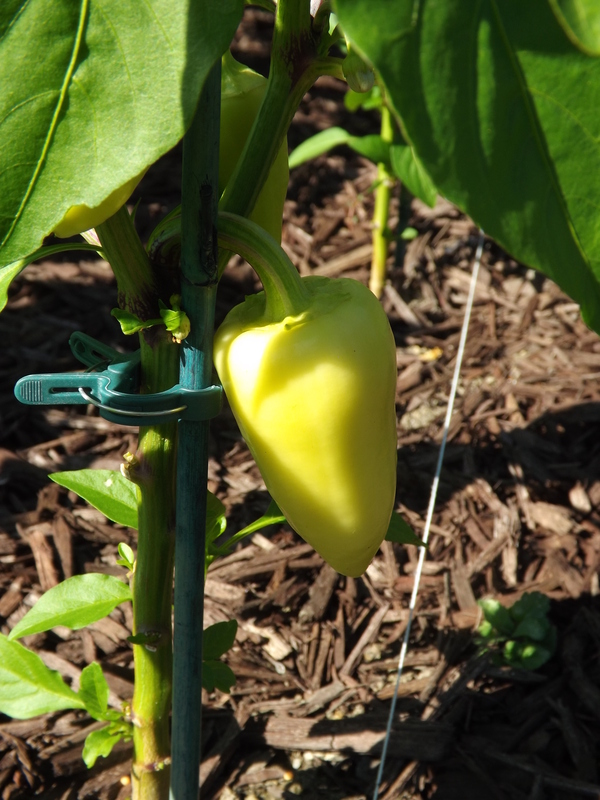 Last year I had great success with my jalapeno peppers, but in the past bell peppers have never fared well in my garden. 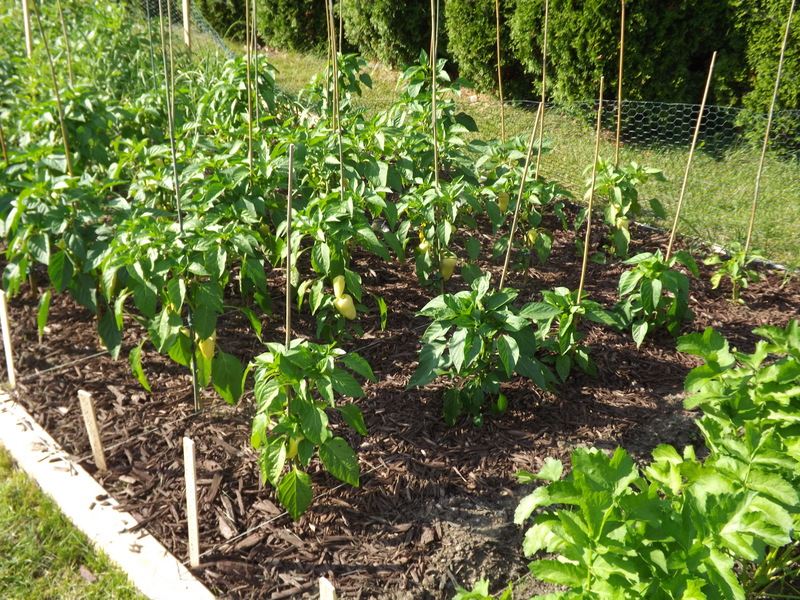 Back in March I ordered seeds for the peppers I usually buy from a local farm and then planted them in early April. 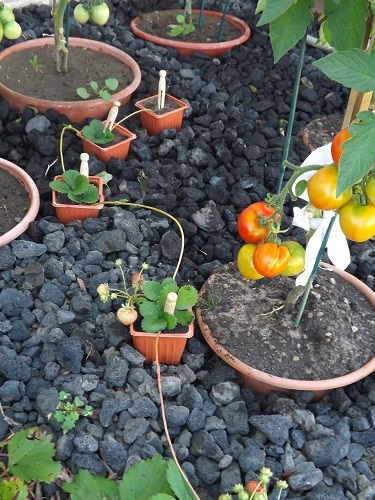 Nearly every seed sprouted and at the end of May I transplanted them into the garden. 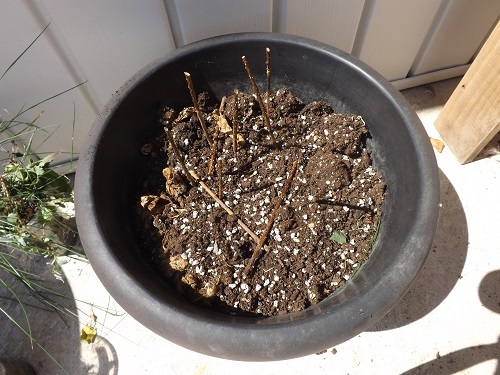 At first the plants seemed to just stall and for several weeks absolutely no new growth was to be found. 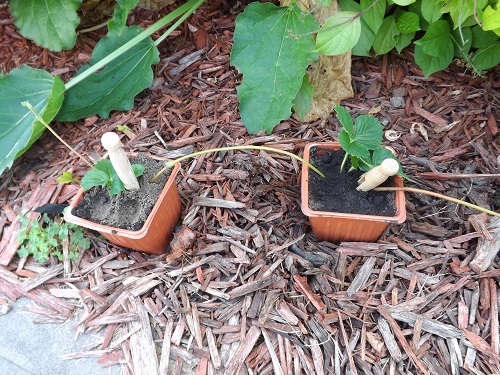 Then, finally in early July the plants took off. 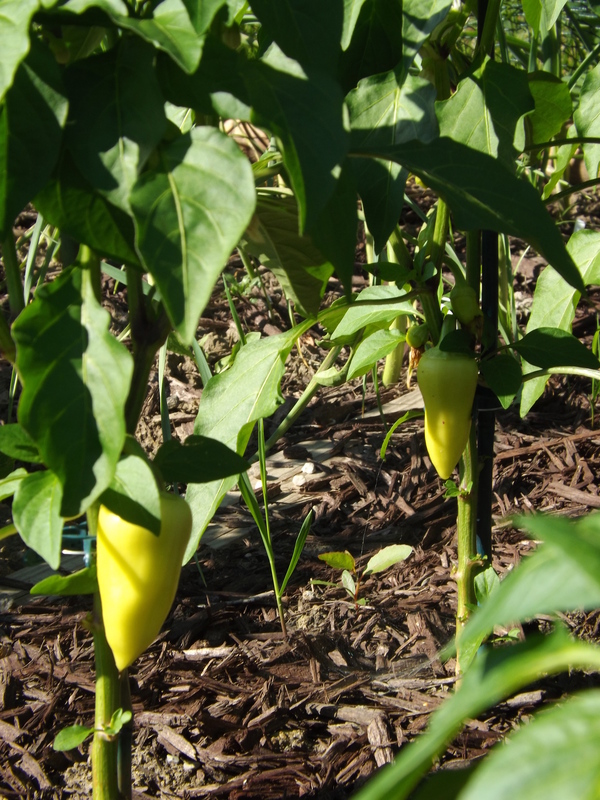 I have picked 9 peppers so far and plan on picking at least five tonight. 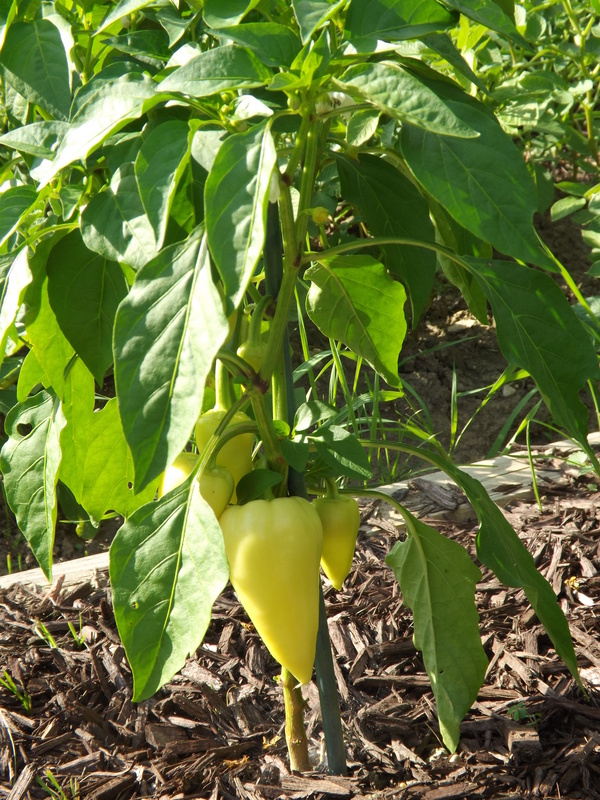 I planted these peppers for pickling, but Hubby is enjoying them too much right out of the garden to even think about depriving him of the fresh peppers just yet. 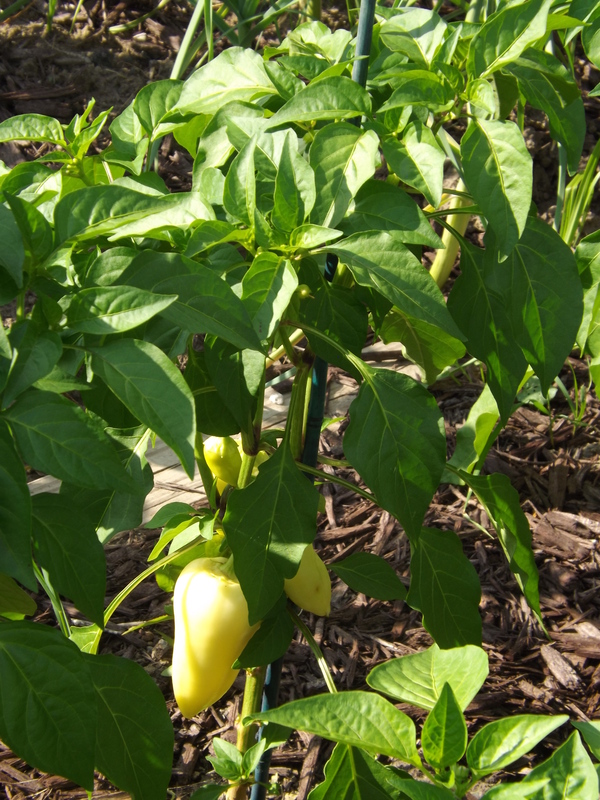 I figure I’ve got a month or so of peppers ahead of us, so even if it means picking up a few from the farmer’s market, I’d rather he enjoy them while he can. Forty plants went into the gardens. 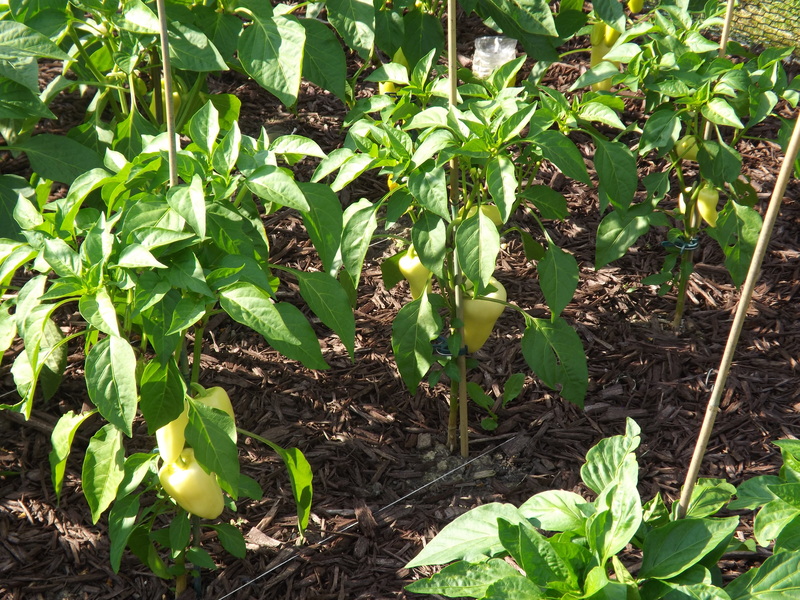 My hope is that we’ll pick at least a bushel of peppers which is what I need to pickle enough for a years supply. Nine is a great start with the plants teeming with more, and for this I am — Simply Grateful. A few years ago I came across an article in a magazine while standing in the check-out line at the grocery store for layered jam. The idea was to layer two separate jams in the same jar before processing in the water bath. This year I finally decided to give it a try using raspberry and blackberry seedless spread. 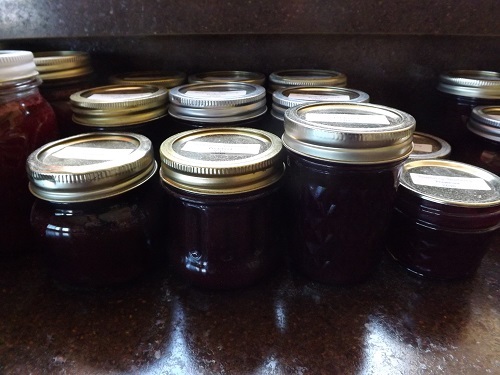 The first step in making a layered jam is to prepare each jam. Combine fruit juice, sugar and lemon juice in stock pot. Bring to near boil. Turn heat to medium-high and add Clear Jel slurry. Bring to boil and cook for 1 minute. Remove from heat. If making a layered spread, cover and set aside. 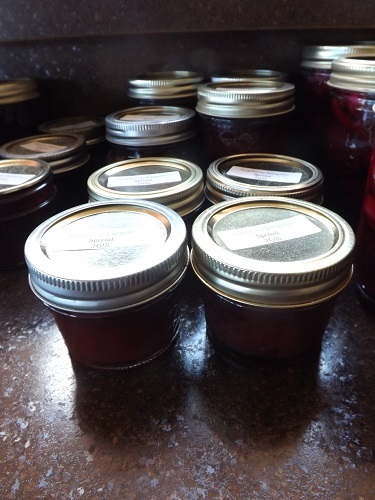 If canning individually, ladle spread into hot jars, adjust lids, and process in water bath canner for 10 minutes. NOTE: If not canning this spread as a “layered spread” the amount of Clear Jel and water to 3 Tbsp. Combine fruit juice and sugar in stock pot. Bring to near boil. Turn heat to medium-high and add Clear Jel slurry. Bring to boil and cook for 1 minute. 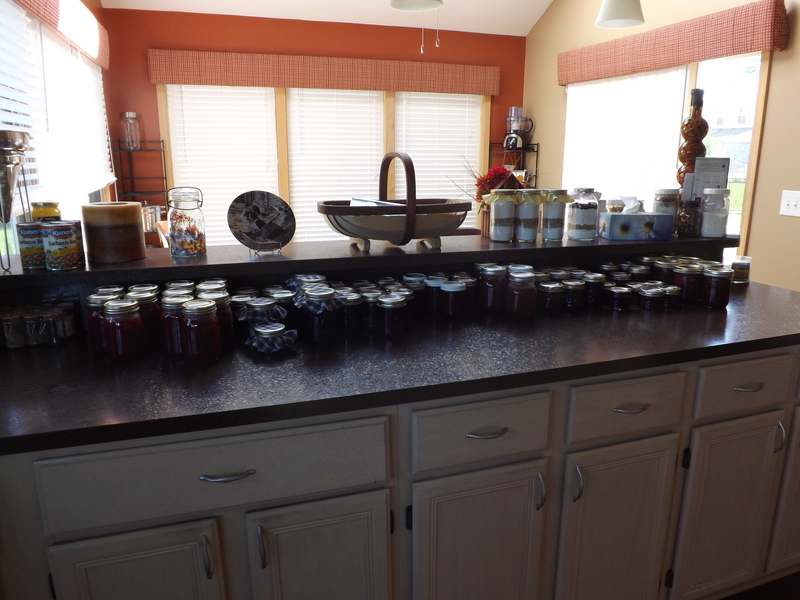 NOTE: If not canning this spread as a “layered spread” the amount of Clear Jel and water to 5 Tbsp. 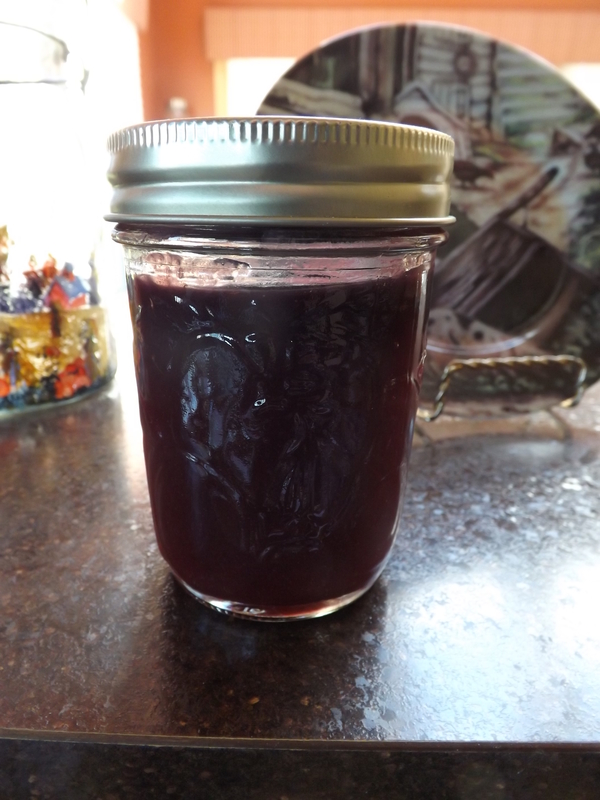 Fill hot jars half full with either blackberry or raspberry seedless spread. Let spread sit in jars for 5 minutes. Ladle second spread carefully into half-full jars. Be sure to ladle hot spread into jars by allowing it to slide down the sides of the jar, this will ensure that the layered effect is visible. Wipe rims, top with hot lids and bands, and process in water bath canner for 10 minutes. 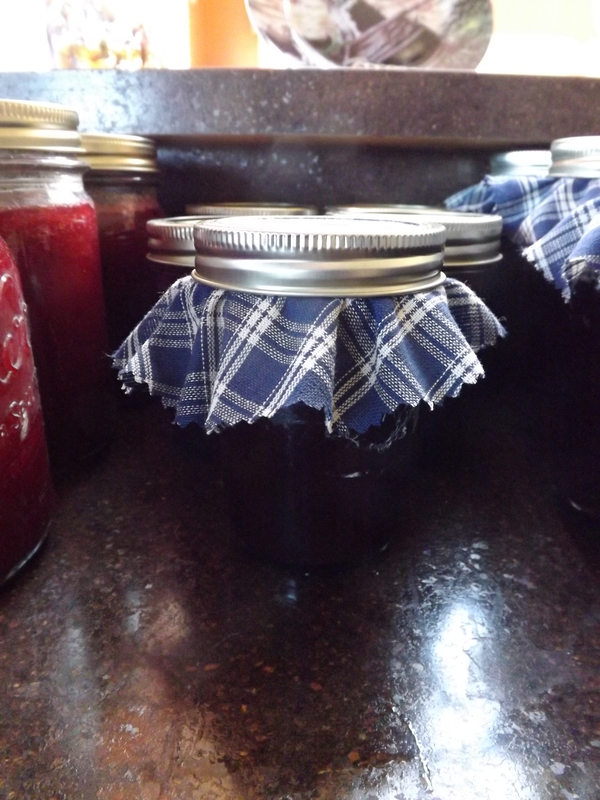 This particular project did not turn out exactly as I had envisioned because my raspberry spread was darker than anticipated and the color differentiation between the two spreads was hardly noticeable. Next time I try making a layered spread, I will use two spreads/jams that have a more noticeable contrast. Although this particular project did not turn out exactly as I wanted, I am glad I tried it. I ended up with some raspberry spread canned separately, blackberry spread canned separately, and then several jars where I layered the two. Experience is the best teacher and even though the jars of layered spread might not be as impressive as I had hoped, I now know how to remedy this in the future, and for this I am — Simply Grateful. The past month has been a whirlwind of gardening, harvesting, fruit picking, canning, but most of all adjustment. Upon returning from our cruise just about a month ago, our lives were thrown into upheaval when Hubby’s work schedule went from working 24-hour shifts Tuesdays and Thursdays and 8-hour shifts Friday through Monday to working 8 o’clock Monday morning until Friday afternoon 4 p.m. straight, as well as Saturday and Sundays 8 a.m. to 4 p.m. I don’t even want to figure out how many hours that is. This new schedule is hard on the family, but mostly hard on Hubby. Because of issues with his aging parents, the relief his father used to offer him Monday thru Friday is no longer in the cards and unless Hubby sells the business or business improves so he can hire a new employee, this is what our life is going to be like until further notice. Hubby being gone so much you’d think I’d have time to do so much more than usual, but this is just not the case. Because he is gone so much I want to have everything around the house done so when he eventually does come home, he doesn’t have anything to worry about. This means all the chores and responsibilities that were once Hubby’s are now mine. Some things can be delegated to the kids, but Grace has her summer job and Zeb has school. Still, the garden and other summer chores/activities will not wait so we push forward making the best of it. What else can we do? Last week the garden harvest was very good and continuous. Each day I was able to harvest either beans, peas, cucumbers, and even our first few cherry tomatoes. All this picking has meant more canning projects added to my to do list, but before I could start these, I had to clear off the counter from canning projects earlier in the week. 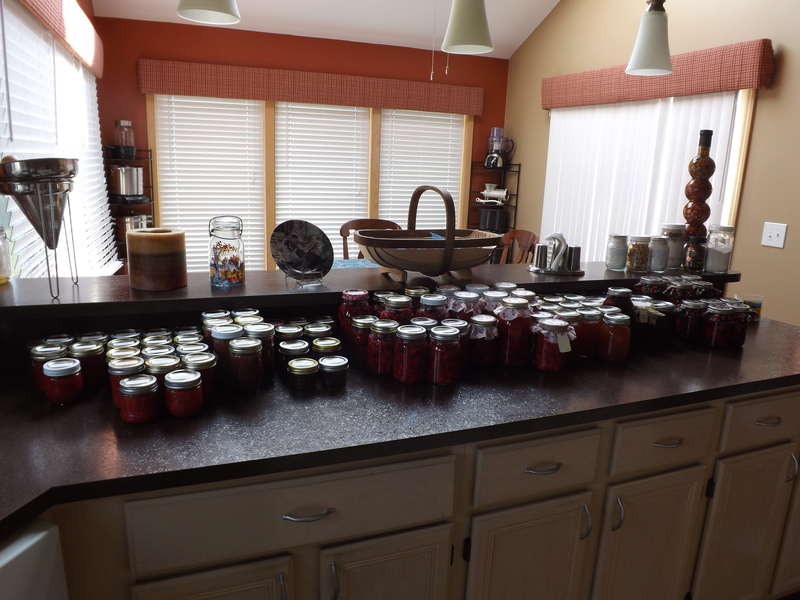 Here is what my counter looked like after canning raspberries, blackberries, and another batch of pickled beets. With raspberries and blackberries off my Summer Canning To Do List, I was set to begin on my Garden Canning To Do List, and for this I am — Simply Grateful. 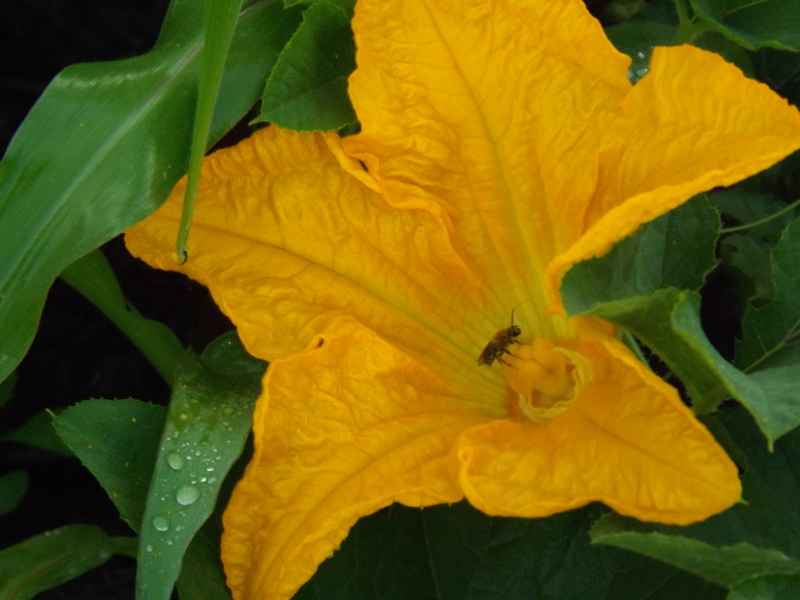 This morning as I sat enjoying my first cup of coffee I peered out the great room doorwall admiring the pumpkin flowers that had bloomed. Movement caught my eye and looking up into the corn I noticed a tiny flock of sparrows chasing each other through the corn, stopping just long enough to tear at the tops of the corn. Uh-huh! 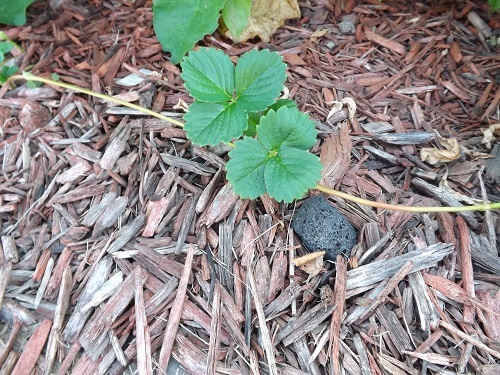 Another unwelcome critter in my garden. 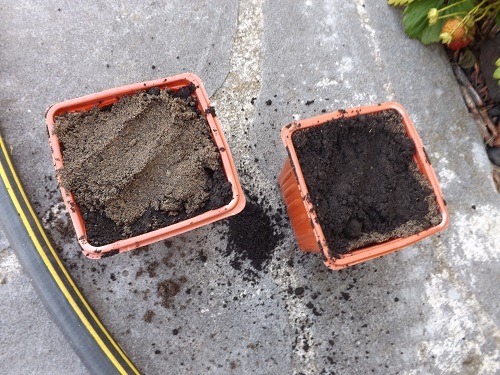 This fix however was going to be much less invasive to the garden and far more fun than eliminating the cucumber beetles, Japanesse beetles, and slugs. Yep, this type of intruder called for a scarecrow. Setting to work, I gathered a 7 foot 1 x 2 and two scrap pieces of 1 x 2 2-feet long each. Next I scavanged an old pair of jeans from my drawer and an old work shirt. Placing the clothing on the 7 foot board I measured out where I wanted the clothing to fall and screwed the 2 foot sections to it. To reinforce the joints I wrapped twine around the cross and tied it off. Next was the fun part, I began to dress my scarecrow. I cut lengths of twine to suspend the pants by the belt loops from the arm bars and then stapled the twine in place so it wouldn’t move. Then I slipped the shirt over the arms and buttoned it up. By this time it was really starting to look good. 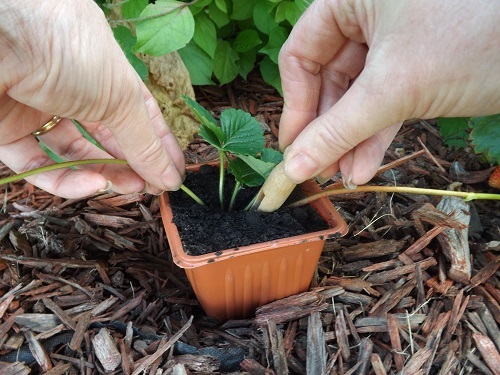 I carried my scarecrow to the garden and pounded it in the ground. It looked good, but of course I was just getting started. Figuring out what to use for the head was a bit of a challenge. Not having any burlap or really any plain material, I recycled an old kitchen apron and stuffed it with plastic bags to make it round. I then slipped the head over the top of the 7 foot board and tied it securely in place just above the collar. Every scarecrow needs a hat, and this I found in my closet. I punched two holes in the brim and ran another length of twine through these and secured the hat to the head, tying it under the chin. The head was filled pretty solid with bags, so the hat was a tight fit, but the twine will make sure that the hat doesn’t fly away should the wind pick up. In order to make sure that this scarecrow did a good job scaring birds and other critters away, I then found two foil pie tins to attach to the arms. I punched a hole in the side of the pie tin, threaded a piece of twine through the hole, attached two washers that would hit the foil tin and make noise, and then pulled the twine back up through the hole. The length of twine was then attached at the very end of the wooden arm frame and the sleeves of the shirt were pulled over the twine. Now the scarecrow really looked like something. But what about a face? Obviously I could use a black marker and draw a face on it, but I could do that anytime. I wanted something really scary, something that would teach these birds a lesson. Then, it came to me. I ran to the computer and began flipping through years of family photos. Finally I found the perfect one. I cropped it, enlarged it, and printed off. Perfect. I cut off the edges and with some straight pins attached it to the head of my scarecrow. Stepping back I laughed out loud. This was too funny. But would Hubby agree? I had to chance it. We walked to the window and looked out at my scarecrow. Hubby burst out laughing, wrapped his arms around me, and gave me a kiss. Now my mother-in-law only lives 5-minutes away, but I see her less than once a month. Hubby sees her more often, but lately only under protest. Mother-in-laws can be great, but not always. This scarecrow is our way of enjoying her company without actually having to spend time with her. I tell you, I have never seen so much of my mother-in-law in my life and she has never made me smile or laugh so much. 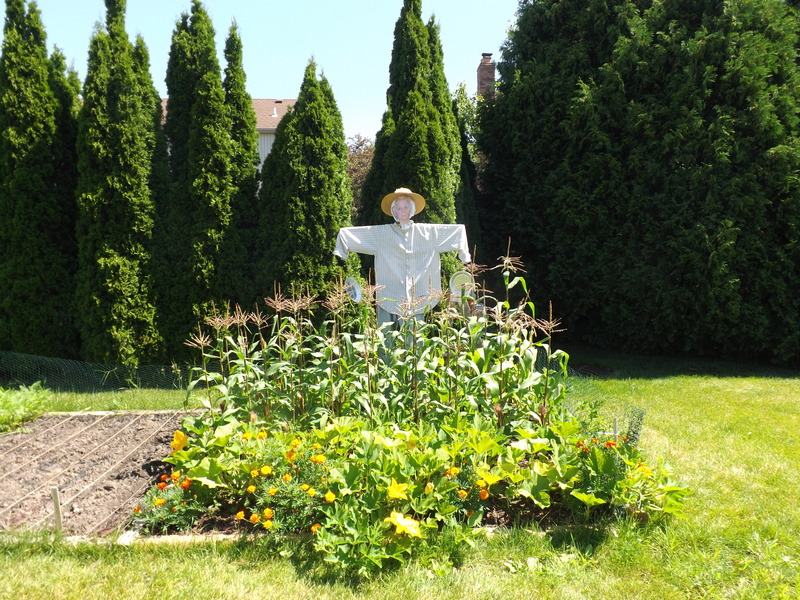 When Hubby was getting ready to leave for the gym a little bit ago he came and gave me a kiss goodbye and I reminded him, “Say goodbye to your mother.” He obediently went to the window and said, “Bye Mom.” How much fun can you have with a scarecrow? 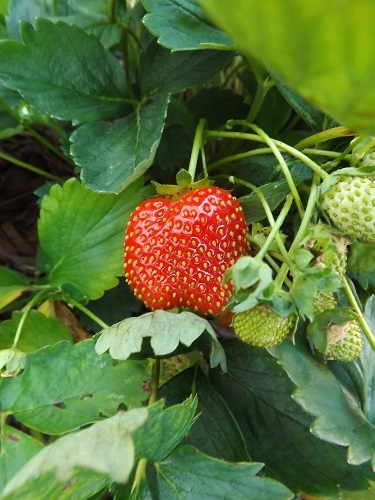 Having fun with the garden — and for this I am, Simply Grateful. Last night before I came in for the night, I checked the pumpkin patch. 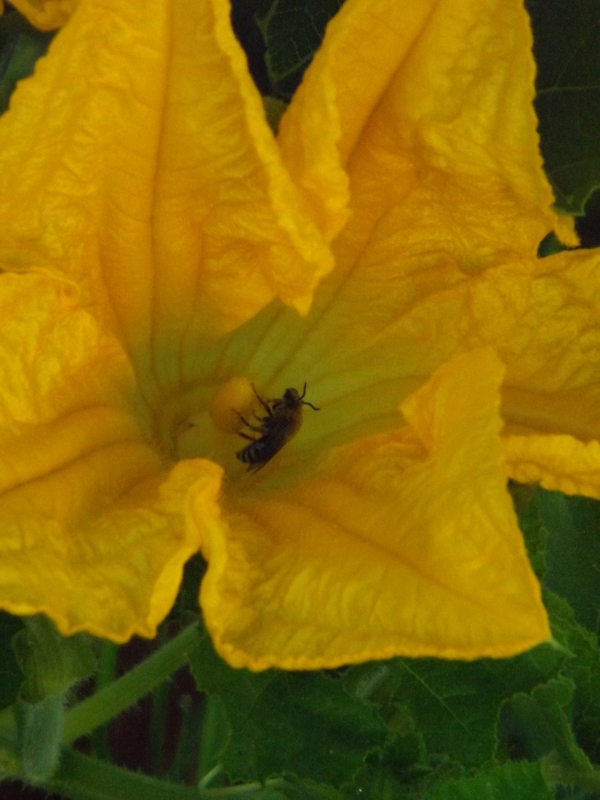 I wanted to know if I’d have to head out early in the morning to pollinate any female flowers. For the past couple of days all we’ve had were male flowers. Upon inspection I found two female flowers that were ready to bloom. This meant I’d be heading out to the garden first thing with paint brush in hand to pollinate some flowers. 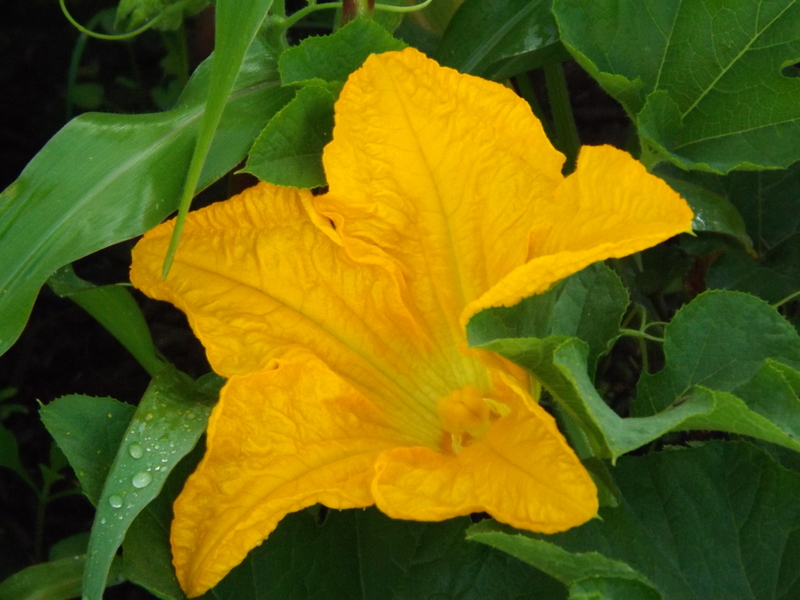 At 6:30 Bell and I stepped out into the hot, humid morning and could see the huge yellow blooms on the pumpkin vines across the yard. 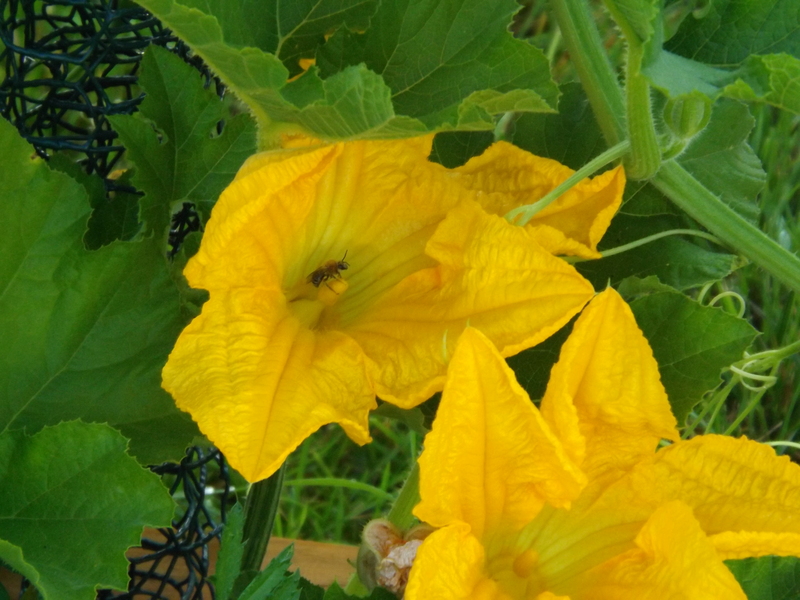 Yep, the bees have finally decided to take over the job of pollinating the pumpkin flowers. and then finally heading over to the female flower — it was amazing. 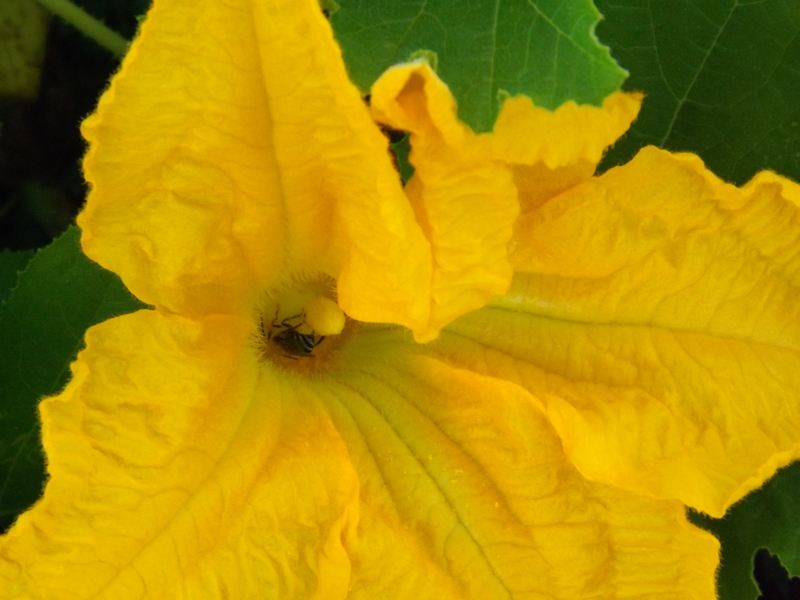 Although I enjoy the process of pollinating the pumpkin flowers, it’s nice to know that Mother Nature has stepped in to take over and do the job, and for this I am — Simply Grateful.